The remedial action was executed for the client under the provisions of New York State Department of Environmental Conservation (NYSDEC). The property was the former location of a Manufactured Gas Plant (MGP). Past MGP operations resulted impacts to the site soil and groundwater. 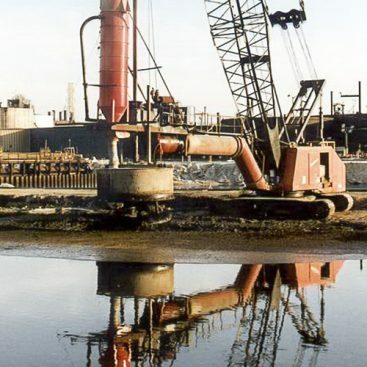 The scope of work includes but is not limited to the following: mobilization, site preparation, site clearing, concrete slab demolition, utility removal and reinstallation, excavation of impacted soils and subsurface structures, steel sheet pile vertical barrier wall installation, soil solidification, on-site management of materials, off-site transportation of materials and demobilization and site restoration. 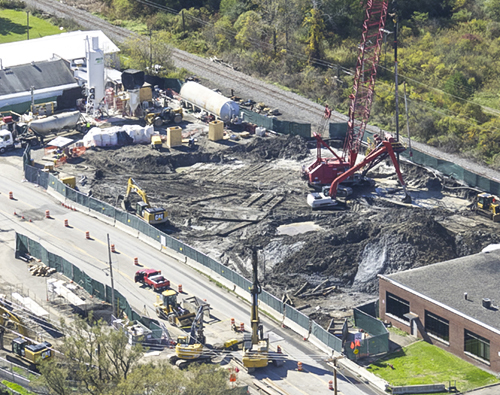 Prior to the work initiating, complex permitting with the NYSDOT and the adjacent railroad was completed by Geo-Solutions to utilize both right-of-ways (ROW) for remedial activities. In addition, to access the impacted soils, multiple utilities required temporary bypass or abandonment during the project. The utility work included bypass of a sanitary sewer, relocation of overhead power, fiber optic and phone lines, as well as crossing two (2) fiber optic trunks in four (4) locations, water line isolation and asbestos sewer line removal. At the outset of the project, site temporary facilities were installed including: construction entrances, water treatment system, concrete barriers as well as a temporary haul road within the railroad ROW and 1-acre lined soil staging area adjacent to a delineated wetand. In addition, 12-inches of concrete surface slab across the footprint of the site was demolished, sized and recycled. Following site preparation two (2) water tight steel sheet pile vertical barrier walls were installed in the NYSDOT ROW, perpendicular to the roadway. Installation required alternating single lane closures and traffic management during excavation of six (6) foot deep trenches and piling installation in close proximity to passersby. 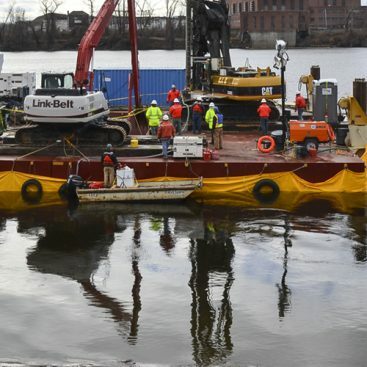 Within the remedial limits, Geo-Solutions performed an excavation 4-5 feet below ground to create a work platform for the ISS work as well as provide freeboard to manage spoils for the 33-47 foot deep columns. The excavation continued deeper to locate and remove any debris beneath. The excavation included demolition and removal of subsurface MGP structures and impacted soils prior to the in-situ solidification. A majority of the soils were staged off-site at the lined soil staging area constructed at the outset of the project. These soils were reused for backfill at completion. Impacted soils were transported and disposed off-site at either a subtitle D facility or at a low temperature thermal treatment facility. Following the complex sequence of utility work and excavation, solidification was performed as the main remedy for the site. 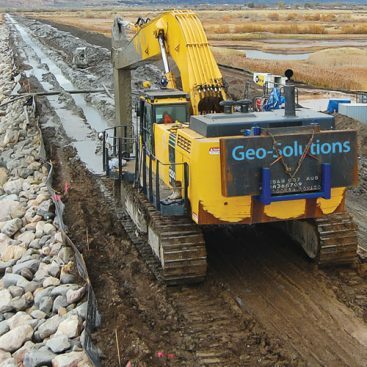 Geo-Solutions performed in-situ Solidification (ISS) utilizing the large diameter auger soil mixing method, to depths of up to 47 feet below the ground. 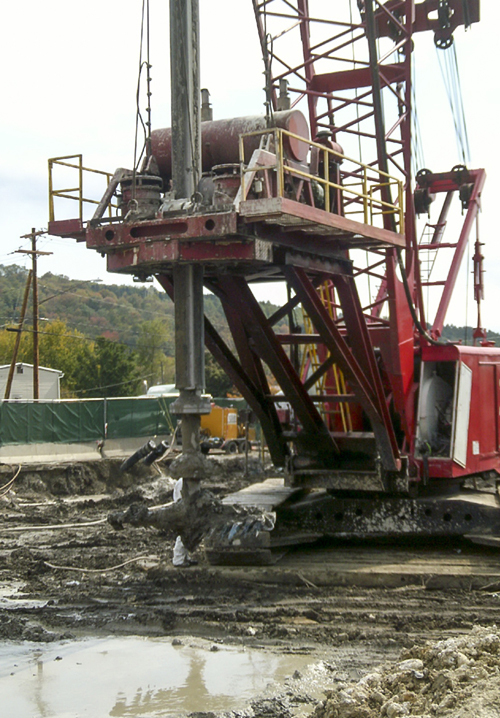 Approximately 57,000 CY of soils were solidified in-place to an average depth of 37 feet bgs for this project. 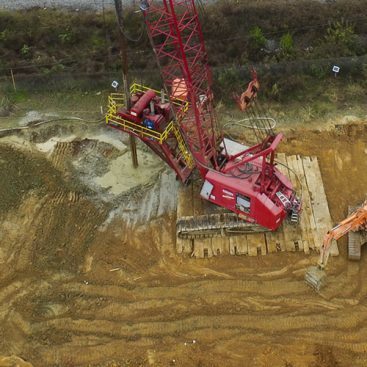 Geo-Solutions utilized a Calweld CH-200, crane mounted drill platform, in conjunction with a Manitowoc 4000w crawler crane to complete the work. The ISS also contained complex sequencing including approximately 100 columns installed around the perimeter of a gas holder, once cured they served as shoring during excavation and demolition of the holder bottom. ISS and remediation work was performed on either side of the highway; the masses were joined by (2) steel sheet pile Vertical Barrier Walls. The last two (2) pairs of sheets were installed in wet soil mix to ensure low permeability connection of the walls and ultimately the solidified masses. At the completion of solidification, spoils were graded and excess spoils were transported and disposed off-site at a Subtitle D facility. Restoration included several surface drainage features to manage stormwater including swales and infiltration areas. In addition, a 40-mil HDPE liner and geotextile cushion was installed over the ISS at (4) feet below ground to serve as a cap. On top of the cap the site was backfilled and compacted to the surface. Restoration also included state highway paving, sidewalks and curb installation as well as re-installation of water, sewer, fiber optic and overhead lines to existing conditions. The soil staging area and haul roads were removed, which were used as backfill where practicable.